I have traveled extensively over the years searching for worthwhile initiatives and like-minded individuals dedicated to the promotion of positive social change. I have been exposed to a number of organizations promising great things (some have, others haven’t), yet my conviction to find noteworthy causes and people of similar interests remains uncompromised. Sometimes my efforts bear little fruit, but then there are moments when effort is compensated handsomely and faith in humanity restored; moments when the long days and late nights all become worth it, when purity and good cause collide. The author meets Joey Lowenstein and his interpreter as Lorraine Cancro and his mother Roberta Lowenstein look on. Photo: Annie Watt. I experienced one of these moments recently. A friend and fellow advocate, Lorraine Cancro, MSW, a psychotherapist and executive director of the Global Stress Initiative (GSI), invited me to a gala sponsored by FACES (Finding a Cure for Epilepsy and Seizures). FACES, affiliated with NYU Langone and its Comprehensive Epilepsy Center, funds research to improve epilepsy care, advances new therapies, and fosters a supportive community for children, families and caregivers who live with the challenges of epilepsy. The gala was held at Chelsea Piers in Manhattan and had over 750 guests in attendance. An inspirational evening that saw Seth Myers of Saturday Night Live (SNL) emcee, bringing wit and a dash of comedy to what is without question a serious illness affecting three million Americans every year, at an estimated $17.6 billion annually. Adam Pressman, Roberta Lowenstein, Lorraine Cancro, Dr. Sandy Lowe, Jim Luce, Anna Castillo, and Richard Peterson at the N.Y.U. Langone event. Photo: Annie Watt. The event was an enormous success raising over $4.5 million dollars for life-enhancing programs in cutting-edge research, clinical care, education, awareness programs, and community building initiatives. FACES Founder Orrin Devinsky, M.D., professor of Neurology, Neurosurgery and Psychiatry, directs the Comprehensive Epilepsy Center at N.Y.U. Langone Medical Center. Photo: Annie Watt. And as if this were not reason enough to declare my support, I was also there to meet a remarkable young man whom I had previously heard so much about. His name is Joey Lowenstein. He is a 16-year-old with autism. He and his mother, Roberta Lowenstein, a long-time supporter of the FACES organization, were present to support the important work being done by FACES and Joey’s doctor, Orin Devinsky, MD. I met Roberta several months earlier at an event we attended and heard about her son but this was the first time I had heard his story directly. Diagnosed with autism at the age of 2, Joey — and Roberta — have endured much over the years. The most inspiring of which was Joey’s recent conquering of a 14-year virtual silence. Unable to communicate through typical speech (or so was thought), Joey had uttered few words through the age of 14. However, this changed two years ago when Joey’s mother, his Rock of Gibraltar, discovered a method of communicating called Rapid Prompting Method (RPM). RPM is an educational platform that utilizes a letter board to help facilitate education and communication. Having tried dozens of therapies over the years nothing could have prepared Roberta for what was coming. Matthew Kennedy, teacher, with Joey and Roberta Lowenstein. Photo: Annie Watt. What was previously impossible became possible when Joey began using a letter board to speak. The flood gates of communication had opened (and so had Roberta’s tears) outpouring 14 years of ‘bottled-up’ expression, thoughts concealed, inner fears unheard and hopeful dreams for the future. It is moments such as these, when I am reminded that there are few forces in the world greater than that which is fueled by a mother’s unconditional love. I know that from my own experience. And though having never been formally taught, Joey could read. He could perform eighth grade math. He can be witty. He can write poetry; possessing a wisdom well beyond his teenage years. The pen really is mightier than the sword! Standing: Bob Roth, Adam Pressman, Anna Castillo, Richard Peterson. Seated: Jim Luce, Lorraine Cancro, Sandy Lowe, and Roberta Lowenstein. Photo: Annie Watt. I have since given considerable thought to what Joey was really asking me that evening and I can not help think just how difficult it must have been to go through life silent, without a voice, for so long. I can’t imagine and I won’t pretend to. What I can and will do is help Joey’s voice be heard. Autism, a seizure, a 14 year silence, and the struggles of teenage adolescence would likely be too much for the ‘average Joe’ to bear; but apparently not for the “average” Joey Lowenstein. About a year ago, demonstrating abilities far beyond what anyone (including his mother) could imagine, Joey told his mom he wanted to start a business that would help others with autism find their own voice — the genesis behind what is now the Joey Lowenstein Foundation (JL Foundation). Their mission was to help others by way of an ‘ANSR’ utilizing Athletics, Nutrition, Self-Development and RPM to do so. This was prior to September 2, 2012, when during a return flight home from vacation, a seizure (Joey’s only) changed his life and the direction of his Foundation forever. As is his nature, Joey has taken a positive stance on the matter and recounts when asked, “The seizure really pleasantly came out of nowhere for me to help other people… average guy Joey knows this, seizure research is one of my awareness bringing missions.” And there it was. Finding an “ANSR” for the Joey Lowenstein Foundation was not enough. Apparently, ANSRS were needed — the final ‘S’ standing for Seizure Research. The JL Foundation’s mission may have changed slightly since that fateful September day, yet amidst the challenges they face (under Joey’s stewardship), the JL Foundation continues to reach beyond the diagnosis of autism and enrich the lives of those affected by helping reveal their ‘unspoken’ gifts. The JL Foundation believes this can be accomplished through Athletics, Nutrition, Self-Development, RPM, and, Seizure Research (“ANSRS”) with each bridging the gap separating those with autism from their true purpose in life. 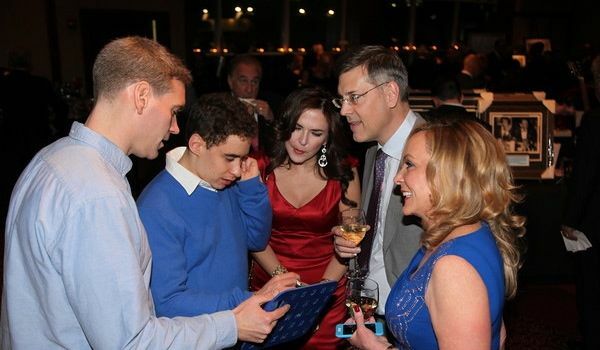 So there I was at the Chelsea Pier gala, surrounded by FACES, determined to find a cure for Epilepsy and Seizures and those dedicated to providing ANSRS, helping those with autism find their voice and their purpose. I could not ask for better company. It isn’t often that you find yourself surrounded by boundless optimism and hope for the future. I wish you all could have been there with me to witness this extraordinary evening. For those of you who weren’t, please meet the incredible Joey Lowenstein. With editing from Richard Peterson.